Josie Stanton has lived and worked on her grandfather’s farm since her parents died, but it’s miserable and lonely living there. Grandfather is a stern man and a real sourpuss who does not show her any affection or appreciation. He treats her like an unpaid labourer, takes her completely for granted, and gives her nothing but work, work, work. Josie’s only friend is the farm dog, Casey, and she does not know what she would do if she ever lost Casey. For this reason she can get quite jealous and possessive if anyone else takes an interest in him. This happens when Casey and Josie encounter a holidaymaker, Mandy Prescott, who is on a caravan holiday with her parents. Mandy is spoiled, but she’s feeling lonely because she has nobody to talk to on holiday, and welcomes Casey’s company. This makes Josie jealous, but there’s worse to come – the Prescotts ask Granddad to sell Casey to them, and he agrees. When Josie finds out, she is heartbroken and furious. She goes after the holidaymakers, but they are now leaving. Josie has no clue as to who they are and where they come from, and neither does Granddad. Josie is even more furious with Granddad when he expresses no apology or sympathy for her hurt feelings. The only gesture he makes is offering her some of the money he made from Casey, which Josie of course refuses. He does not listen to her pleas to help find Casey either. He tells her she can always get another dog, so shut up and get on with the chores. That’s the last straw for Josie. She tells him to get another slave and runs off in search of Casey. Josie has a stroke of luck at Bill’s garage when he happens to mention the holidaymakers. She questions Bill about them. Fortunately Bill did some mechanical work for them and is able to give her their name and address. Josie sells her jacket to catch a train there. Meanwhile, spoilt Mandy has begun to realise the responsibility of looking after a dog and is not even bothering to walk him. All the same, when Josie turns up, Mandy is not going to give Casey up without a fight. And a fight is precisely what it turns into, right on the doorstep! However, while the girls are fighting, Casey runs off. And being a country dog, being lost in traffic would be dangerous for him. When Josie tells Mandy this, she is upset and agrees to help search, but in vain. Josie tells Mandy why Casey means so much to her, and Mandy repents taking Casey away from her. She did so because she was jealous of seeing Casey and Josie together and did not understand the circumstances. Granddad is summoned. He is now deeply sorry for what happened, especially after he hears Josie saying that she thinks she means nothing to him except cheap labour. He really does love her, but it took the shock of her running off to get him to show it. Casey then returns, and once they realise Casey wants them to share him, it’s agreed he will return to the farm and the Prescotts will visit him every holiday. So Josie returns to a home that is much better than before, and with a new friend in Mandy. During 1979 Jinty ran several three-part stories that feel underdeveloped and would have been far better stories if they had been given more episodes. This one also feels like it’s over before it’s hardly begun. Though it probably does not have enough steam to stretch out into a standard length serial, a bit more length to turn it into, say, a six-parter like “Food for Fagin”, would have developed the characters more and made the story a far better one. For example, the story could have developed more insights into the grandfather and why he is so stern towards Josie. Is he just one of those people who are not the demonstrative type and don’t find it easy to express affection? Is it something in his past? Is it sexist attitudes towards females, seeing them as only fit to slave around the house? Or is it something else? And we could also have seen more of just how much life has changed at the farm and how things have improved between Josie and her grandfather. We get a taste of how Josie’s lonely home life and lack of friends except Casey has bred some unhealthy traits in her, such as her possessiveness and unwillingness to share Casey. There is some hint that her miserable life is turning her into a sourpuss in the eyes of everyone else; for example, Bill tells Josie she ought to smile more than she does. But we don’t know for sure because it’s not explained or developed enough. What does emerge is Josie not only becoming a happier person but learning to show it. Still, more episodes could have developed Josie further. For example, what is her school life like? No schoolmates visit her farm, but does she have any friends at school? More length could have also developed the emotional elements more. As it is, we can see it has plenty of potential. Although Granddad is not cruel or abusive as some guardians in Jinty serials are, he definitely is thoughtless and insensitive towards Josie. It’s no wonder she thinks he has a heart of stone, couldn’t care less about her, and she is so miserable living with him. It turns out that he does have a heart and loves Josie, but it takes the shock of seeing the consequences of his thoughtlessness to bring it out. Josie and Mandy are both in their own ways miserable people and both seek friends and companionship, with they eventually get in a most ironic way – through Granddad’s thoughtlessness. Publication: 11 May 1974-1 November 1975. Returned 31 January 1976-5 June 1976. Writer: Various, including Terence (Terry) Magee and Pat Mills. It has been said that the Cinderella story is (according to Pat Mills) one of the lynchpins in a girls’ comics. Well, it could also be said that in girls’ comics there are two types of Cinderella stories. The first is the serious type, with the ill-used heroine suffering constant exploitation and abuse from nasty guardians and struggling to find a way to escape. The second is the humour type, whereby the heroine is treated like Cinderella, but each week ends in a comical comeuppance for the nasty, scheming slave driver, and our heroine gets the last laugh (until next time). The best known of these is probably “Cinderella Jones” from Judy. In Jinty’s first line-up, “Make-Believe Mandy” belonged to the first type. 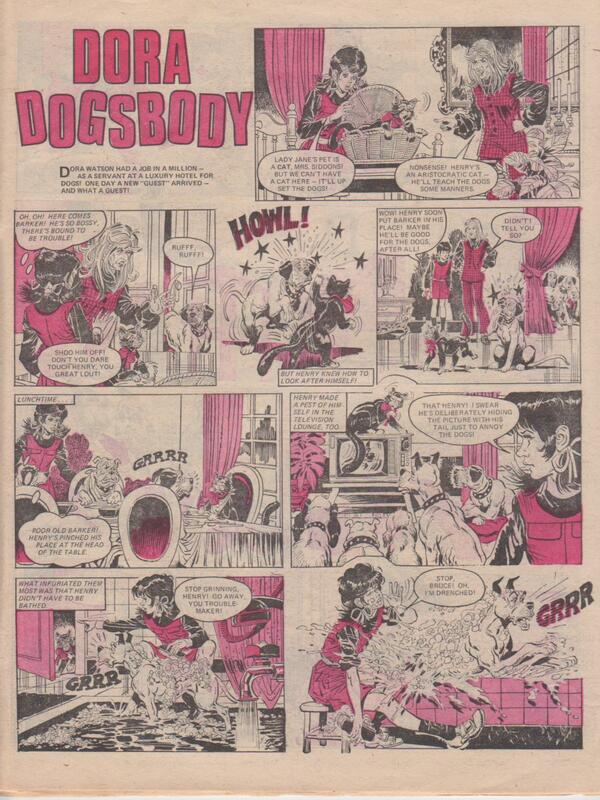 And Dora Dogsbody, the strip under discussion here, belonged to the second type. Dora Dogsbody is the first story to greet us when we open the first issue of Jinty. And as it is drawn by the popular José Casanovas whose style works brilliantly with animals, humour and the zany, it catches our attention immediately. Casanovas’ art is the type you can fall in love with immediately. Dora Watson has lived in an orphanage until one day she is out for a walk. She rescues a dog (which she names Scamp) from being beaten up by bigger ones and in so doing demonstrates a way with dogs that does not go unnoticed by Mr and Mrs Siddons. They explain that they run a dogs’ hotel and ask Dora to come and live with them in exchange for helping their dog guests. It seems like a dream come true for any orphanage girl – a home at last. And the hotel sure is swanky for the dogs. They dine at posh tables as if they were humans (complete with napkins around their necks) and eat caviar and steaks. They have a television room, a room each, and are in every way pampered. But Dora notices that they still look miserable and believes it is not because they are treated like real dogs. As a matter of fact, Mrs Siddons shows that she is no animal lover. In fact, she has a cruel streak towards them. For example, when Scamp chases a cat in the hotel (which frightens the dogs), Mrs Siddons kicks him. She is a snob who does not regard Scamp in the same league as her pampered guests. And for all her pampering, Mrs Siddons soon shows that she has little love for her own doggy guests; for example, she is not above undercutting their food as punishment or to make economies. Clearly, Mrs Siddons is only running the dog hotel for the money. And initially, Mr Siddons is as bad as his wife, though the weaker of the two. Later he becomes more of a henpecked husband in the grip of his dominant wife, and Dora takes a sly hand to help him at times. For example, she plays on Mrs Siddons’ vanity so Mr Siddons will play Sherlock Holmes in a fancy dress parade as he wants to do, instead of being coerced into being Charles II so Mrs Siddons can play Nell Gwynn. But back to the first episode. As you might have guessed, the Siddonses have not adopted Dora out of the kindness of their hearts. Dora soon finds that Mrs Siddons only wants her as a skivvy who does all the dirty work in the hotel. She is also given a cold, draughty room that is a far cry from the luxurious dogs’ rooms and fed on scraps. But she decides to stay on to see if she can turn things around for these dogs. So each week it is Dora vs Mrs Siddons, whether it is to foil one of Mrs Siddons’ grasping machinations, to save a problem dog, or some other scrape. Some of these have included Biscuit, a dog who is in danger of being put down because he seems to attack women. Mrs Siddons does not listen to the circus owner’s explanation that the dog was only doing his old circus act of caning women with red hair, but Dora outsmarts her and restores Biscuit to the circus. In another story, Mrs Siddons wants to put down another dog, Binkie, because he is blind, and Dora is rather hard put to save Binkie’s life. Other dogs have bizarre or even dangerous behaviours that Dora is frequently lumbered with sorting out. For example, Dora is lumbered with taming a difficult dog, Wolf, which she eventually does with the help of another dog, Kipper. However, Mrs Siddons does not appreciate Kipper – and is even more furious when Dora gives the money for taming Wolf to Kipper’s owner. Some animals are not even dogs, such as Henry the cat. Mrs Siddons insists on having Henry in the hotel because his owner, Lady Jane, is an aristocrat. But Henry soon proves a horrible cat that deliberately causes trouble for the dogs the moment he is let out of his basket. Occasionally it does not all go Dora’s way, which helps to keep it fresh. For example, in one episode, Dora thinks she has foiled Mrs Siddons again – until Mrs Siddons tells her that they are now lumbered with a pile of turnips and she will be eating them all week. In another, Dora and the dogs go on a walk-out in protest against Mrs Siddons’ cost-cutting measures which include depriving them of food, heat and light – and in winter weather! But the march is a disaster because of bad weather. Dora proved one of the most popular and long-lasting strips in Jinty’s first line-up. She was the only one of two Jinty characters to return after a break and, unlike “Fran’ll Fix It!”, it was not due to popular demand from readers. You know the type – too strict, too old-fashioned, too snobby, or way too over-protective. They make you feel like a virtual prisoner, never let you have any freedom, and you feel you’re not being allowed to grow up. Or they keep forcing you to do what they want and won’t let you do what you want. Parents like that cropped up frequently in girls’ comics. Their attitudes were what drives the story, causing untold misery that could be avoided if only they acted differently, before (with a few exceptions) the happy ending where they finally see the error of their ways. Often their attitude stems from some giant chip on their shoulder, the product of a tragic event which turned them into what they are. Such is the case of Mrs Marshall, who goes to ridiculous and unfair lengths to keep her daughter Laura and then her pet dog, Winston, away from germs and common “riff-raff” because…no, it will not be revealed yet. The reason why Mrs Marshall acts this way is meant to be a mystery that keeps readers guessing until the end of the story. The Marshalls are a rich family who life in an upper class house in Happy-Hillcock Estate. Mrs Marshall hates “common riff-raff” and takes the silliest of precautions to protect her daughter Laura from their “germs”. Mrs Marshall drives Laura to school so she does not catch any germs from council estate houses (and nobody is living in them yet!). In class, Laura has to sit alone to avoid catching germs from “common” children, under orders from her mother. When new girl Josie from the estate is seated next to Laura, Mrs Marshall yanks Laura right out of school and hires a dragon of a home tutor for her. When the council starts moving more people to the estate houses, Mrs Marshall launches a campaign against the influx of “common riff-raff”, although the council is only doing it to liberate the people from slum areas. Poor Laura is caught in the middle, between being forced to help both her mother and Josie’s rival campaign for more estate houses. 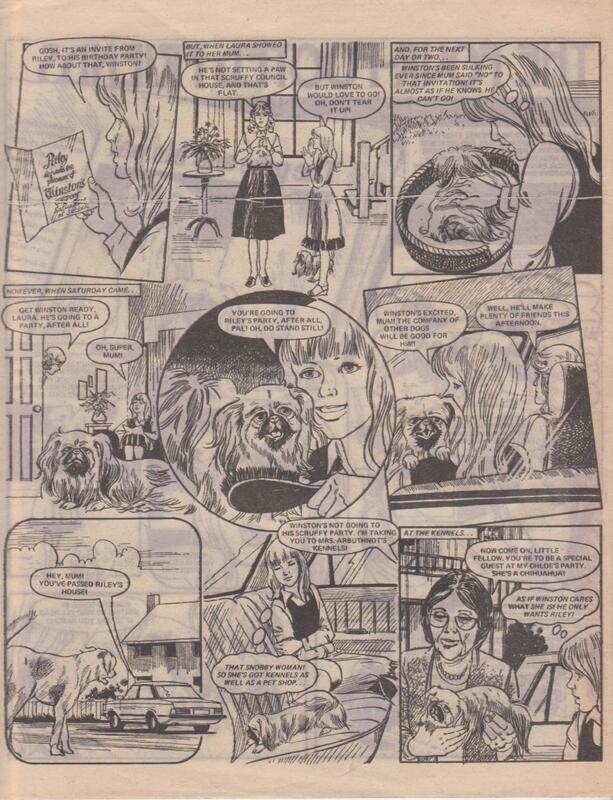 Mrs Marshall buys a Pekinese, Winston, as a companion for Laura, because she has become even more lonely and miserable after being yanked out of school. Winston becomes inseparable with Josie’s mongrel, Riley. Unfortunately Mrs Marshall is as over-protective of Winston as she is of Laura, and makes his life just as miserable to protect him from Riley’s “germs”. She goes as far as to demand that Riley be destroyed, although Winston pines without Riley. She does not listen to concerns that the dogs love each other too much. No wonder Riley and Winston try to run away together, and get into all sorts of scrapes while trying to stay together. This provides a lot of animal humour, such as hiding in coal bins and singing doggy duets to Mrs Marshall’s piano rendition of “Danny Boy”. When Mr Marshall returns from abroad, things start turning around. Mr Marshall knows the reason for his wife’s problem, but he does not share it. He tries to talk sense into her, telling her to let the past die, not blame all common people for what happened, and that she is fussing over Laura too much. But Mrs Marshall is not listening, and is even more furious to find her husband helping the growing estate by building a supermarket. But Mrs Marshall is forced to make concessions when Mr Marshall uses Riley as a guard dog, and even she is moved when she herself sees the slums the people are being moved from. But Mrs Marshall still clings to her snobby, overprotective ways. Eventually Laura gets so fed up with her mother that she runs off. Running away is a common means of climaxing these types of stories and resolving them, and this one is no exception. Riley saves Laura from a nasty accident and Mrs Marshall is so moved (perhaps a bit too quickly?) that she asks Riley’s forgiveness and has a change of heart. Later, the mystery of Mrs Marshall’s problem is finally revealed. Her baby son Alan died from an illness that she believes was contracted from a dirty dummy that a grubby kid shoved into his mouth. Hence her problem with common people and germs, but now she finally realises she has been “unjust and ridiculous.” Thereafter, there is no looking back and we get the happy ending we have been waiting for. There certainly is a lot to make this story popular with readers. It is a strong commentary (and satire?) on over-protective parents, and so many kids can identify with Laura’s situation. Readers also love mystery, and it grows increasingly apparent that there is a mystery behind Mrs Marshall’s attitude. We see it in the way she keeps staring at a photograph in her room and saying how common people have caused her heartache. What does she mean? The question goes unanswered until the last episode, presumably so readers can have a go at solving it and make it even more fun. Readers also love a story that makes a statement against snobbery. As Mrs Marshall causes increasing trouble with her snobbish attitudes, we are just waiting to see how she has a change of heart, or failing that, her comeuppance. The story also makes a strong call for tolerance, as represented by the two dogs. Someone tells Mrs Marshall that if a pedigree and a mongrel can get along, why can’t we rich people and common people? Once Mrs Marshall gets the message, she reiterates it in a big way. She has Riley and Winston jointly open the supermarket: “They both think a mongrel’s as good as a Peke, any day!” Above all perhaps, it has dogs. Who doesn’t love an animal story? And this one is full of animal antics ranging from scrapes that give us loads of laughs, to tears when the dogs come under threat from Mrs Marshalls’ stupidity, and admiration at the dogs’ determination and courage to beat Mrs Marshall and stay together.